The Battle of the Monongahela took place on 9 July 1755 in the vicinity of present-day Braddock, Pennsylvania, ten miles upstream from Pittsburgh during the French and Indian War. A British force under General Edward Braddock, moving to take Fort Duquesne, was defeated by a force of French troops, with its Native American allies. The defeat marked the end of the Braddock expedition by which the British had hoped to capture Fort Duquesne and gain control of the strategic Ohio Country. Braddock was mortally wounded in the battle and died during the retreat. The remainder of the column retreated southwards and the fort remained in French hands until its capture in 1758. The battle has often been incorrectly portrayed as an ambush by the French and Indian forces; they were in fact as surprised as the British were at the start of the engagement. 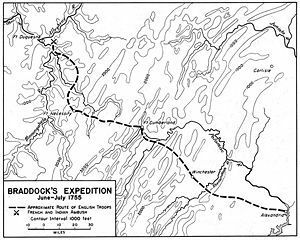 The Braddock expedition, also called Braddock's campaign or, more commonly, Braddock's Defeat, was a failed British attempt to capture the French Fort Duquesne in the summer of 1755 during the French and Indian War that ended with the Battle of the Monongahela. The expedition takes its name from General Edward Braddock, who led the British forces and died in the effort. Braddock's defeat was a major setback for the British in the early stages of the war with France and one of the most disastrous defeats for the British in the eighteenth century.